When Liam was born, our second son, nighttime took on a whole new routine. Luke hadn’t been what you would call a good sleeper, but Liam took that idea to a whole new level. It took him forever to fall asleep. He struggled with stomach pains and woke frequently, needing pressure on his belly to go back to sleep. Rather than despair or fight it, I just found a new routine. Around six each night, he and I would lay in my bed, nursing, playing, reading, until he would decide to drop off. I would stay there and Luke would come in for his bedtime routine as well, Liam rolling over in our giant bed so that Luke could read one last book before he would go to sleep as well. 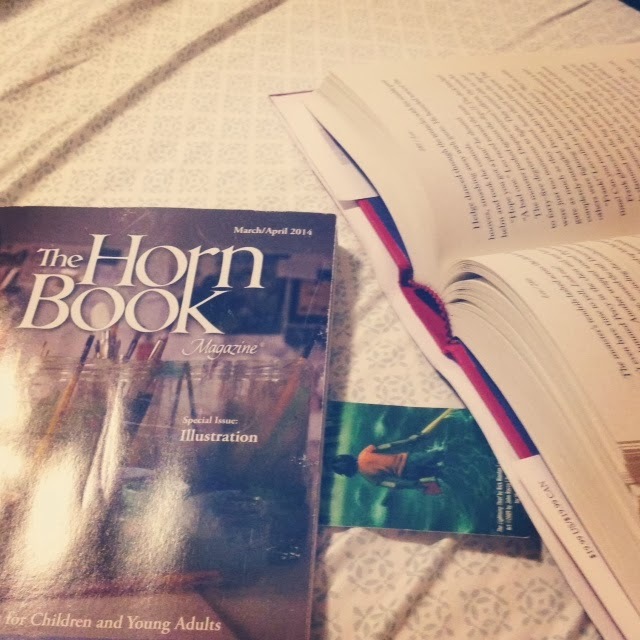 Tonight I looked up from reading the newest Horn Book and thought of how much I enjoyed this quiet way to end my day. Books and my boys over the past eleven years – many things have changed, but what is important has stayed the same. 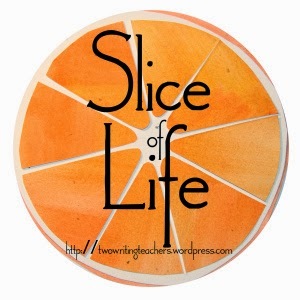 Quick note – March begins the Slice of Life challenge on Two Writing Teachers. You can read more about it on their blog, but you essentially commit to attempting to record a “slice” of your day each day for the month of March – not just on Tuesdays. I will be joining in once again – some slices will focus on my classroom, some on my life. My students will be doing a version of it in our class as well, but in their journals. Even if you aren’t a blogger, why not join in by trying to journal each day in March? It is a wonderful way to spend a month. This week in reading class we have been discussing point of view. 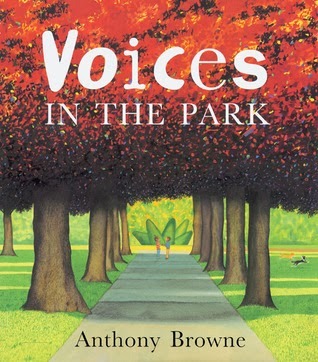 We began the short unit with one of my favorite books – Voices In the Park. More than any other year, my students were fascinated by this book. All three classes remarked how the “story” changed once you saw other sides, or other’s point of view. As we talked about this, and flipped back and forth between the voices to compare, I couldn’t help but weave a character lesson in. I talked about how in my many years in the classroom kids have come to me frustrated – trying to figure out why “Nick” is angry with them. Typically I break down the scenario with them and we eventually realize that why they might not have done anything wrong, something they did offended the other child and we need to acknowledge that. Often a child will say, “I didn’t think I did anything, but I hadn’t seen it from his point of view.” Exactly. Kids get it. While they might not always agree, they are receptive and willing to discuss, to see something from another’s perspective. Adults aren’t so easy. My heart has hurt as I have skimmed Facebook of late. People post in anger. Tempers flare, names are called, the willingness to punch someone – while in jest, I hope, is posted. For someone who tends to believe that people are inherently good, this has been tough for me. What once were frustrations you might tell your partner over a drink at the end of the night, on the phone to your best friend, is printed for the world to see. I’ve seen comments about myself, my school, teachers, friends, kids – kids, that are simply untrue. And while I could jump in, make my voice heard, I don’t. A wise friend said to me the other day that we don’t win in life being the “right fighter”, we just get beaten down. Fighting to make everyone see our point of view, to see what is “true” is not going to make me happy in the end. So, I let it go. Letting go isn’t easy, but I work each day to start fresh, to start with a positive attitude. Some days are easier than others. What makes it worthwhile is these kids. And so today we talked about point of view. They marveled at Charles and Smudge. At Charles’s mom – why was she so angry? They studied Anthony Browne’s illustrations with wonder – why did he change the lamp to a flower? What’s up with the burning tree? And we talked point of view. How hearing all sides of the story changes everything. I realized that I can’t change others, that I don’t want to try to be the “right fighter”, but with these kids I have already won. While the adults might not use social media in a positive way, I am watching this group do so much good. I think I need to focus on them. From that perspective, it’s easy to feel good. Last Sunday NCTE held an amazing chat hosted by Franki Sibberson and Antero Garcia on formative assessment. I’m embarrassed to share that it has only been in the last four years that I have even thought about formative assessment. While my elementary education program was good, there are definite gaps in my learning. We talked a lot about assessing students, but it was never broken down into formative and summative assessments. It was only in getting my second masters to be an administrator that I heard the two terms. Wow. I remember sitting in the class thinking of how powerful it was. I clearly remember reflecting that so much focus is on the summative assessment when, in my mind, formative is the critical piece. I am now constantly reflecting on assessment in my classroom. Sure we have the “big” assessments that loom over us – ISATs (our state test), benchmarks, etc. – but in my mind they don’t create the picture of who the children are that fill my room. It is the daily assessments that do. This week I reflected on all of the ways that I “assessed” my students and what those assessments told me. I thought I would share just a few here today. Owen checking in with Bomb by Sheinkin told me his page number and said, “You were right, I love this book.” Several kids immediately swiveled in their seats to check it out. Leah shouted her page number for Paperboy and said, “When am I going to learn his name? This is making me crazy.” The kids who had read it began to whisper excitedly. Madi looked up from When the Butterflies Came and said her page number before looking back at the book. Lexi and Sari looked at her and then me, “She’s at the part! !” Madi looked up and grinned. The buzz of excitement, the titles being shared, the comments about books let me gauge the pulse of our reading community. That Skitter McKitter has run away. In all three classes a gasp rose from the collective group, a clear sign of engagement. When I finished the poem, I closed the book. That was our stopping point in each class so we could finish on Thursday and take our unit test (summative assessment) on Friday. The outcry that rose upon the book being closed made me smile. Many comments were shared about how I left them at a cliffhanger. As we moved to independent reading and conferring, I heard whispered conversations – would Creech let Jack’s cat leave and not return? Someone said no, she wouldn’t be that mean. Another child said, “But remember Sky…” J These kids are invested in the book and it is amazing. I teach six students each day in our reading intervention class. We do a variety of things – work with short texts, check out websites like Wonderopolis, read alouds, work with fluency and comprehension, etc. Friday was one of those days you dread as a teacher. I didn’t feel great before school, but thought I’d be fine. I arrived at school and knew that I had been wrong. My stomach was rolling, by lunch I had a slight fever. At that point I knew that I just needed to push through. By the time I could get a sub, it would be time to go home. With that thought, my RTI class came in. I looked at them and confessed, I felt horrible. I didn’t think I could teach an entire lesson. I asked each to grab an iPad and said I thought we could work on reading comprehension. I wanted them to think of a topic they were interested in – any topic. For the next 15 minutes they were to research that topic and monitor their comprehension. When they learned something they thought they would want to share with us, they needed to jot it down so they could remember it later. What followed was possibly the most amazing fifteen minutes of RTI this year. Each child was beyond engaged. They researched a variety of topics, from Kazu Kibuishi to whether cheerleading is considered a sport. While I had created the lesson on the spot as a time filler when I couldn’t “teach”, I gleaned more formative assessment data than I had ever dreamed. When engaged with a subject matter that was important to them, all six students were highly successful readers. When allowed to talk without reminders for quiet, without admonishments to get back to their reading, they deepened their comprehension. Amazing. Formative assessment is part of our daily lives in our classrooms. If you would like to continue your thinking on it, please check out NCTE’s amazing position statement on it HERE. Also, be sure to check out Franki Sibberson's blog, A Year of Reading, for more posts about formative assessment next week. I think this is a conversation we need to continue.